Activist Jack Weinberg famously warned 1960s youth not to trust anyone over 30. When Dr. David L. Holmes spoke at Samford convocation Oct. 4, he suggested that a personal sense of purpose and direction often arrives only after reaching that once-suspect age. 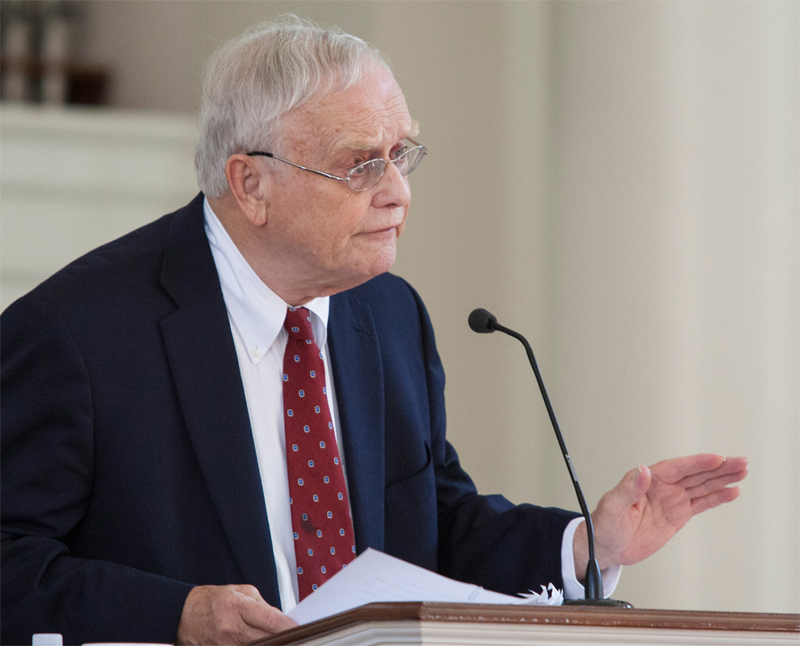 Samford’s Religion Department hosted Holmes, a noted author and Walter G. Mason Professor of Religious Studies, emeritus, at the College of William and Mary. His books include The Faiths of the Postwar Presidents: From Truman to Obama (2012), A Brief History of the Episcopal Church (1993) and The Faiths of the Founding Fathers (2006). At Samford, Holmes warned students against rushing into relationships and careers soon after the challenging and vibrant college years. Getting clear of that tumultuous time allows the real person to emerge, he said. Holmes noted that many influential historical figures--Albert Schweitzer, Ronald Reagan, Dianne Fossey, Margaret Sanger, Malcom X, C.S. Lewis and John Donne to name a few-- didn't find their calling until mid-life. Even Buddha, Augustine of Hippo, Martin Luther and John Wesley fit that model. Holmes pointed out that Jesus is said to have begun his ministry at about the age of 30, in keeping with rabbinical requirements and traditions of the period. The influence of these figures is well known, but Holmes lingered on the fictional portrait in Sinclair Lewis’ 1922 novel Babbit, an indictment of American culture and conformity. The book describes the life of George Babbit, a man lacking the courage to truly follow his heart, who enters a loveless marriage and lives vicariously through his son before finally admitting his own emptiness. “The novel embodies a critical truth for college students, and that truth is that we must follow our hearts and do what we really want to do in life, or else we may live lives of quiet desperation,” Holmes said.